A common question posed “wow, isn’t everything cheap in Thailand?” Yes, and no. Yes, if you are a foreigner and used to prices in Europe, North America and Northern Asia. Yes if you eat local foods and buy local products. No, prices are not cheap for many Thais and are not cheap for any imported foods. Or brands. And so there is a picture of what tbh40 (about US$1.25) will get you- a full lunch (at least for me). This bowl of noodles is a favorite of mine- fish, pork balls, small rice noodles, beans sprouts, a bit of cilantro and green onion. And a few chili’s. Or, you could not each lunch for two days and buy a small ‘american’ coffee at Starbucks for thb70. Wow, how does that work? A small coffee is 2x the cost of a bowl of noodles? The noodles are boiled right in front of you, based on the few cups of Starbucks I have had in my life, the same claim cannot be made by Starbucks. 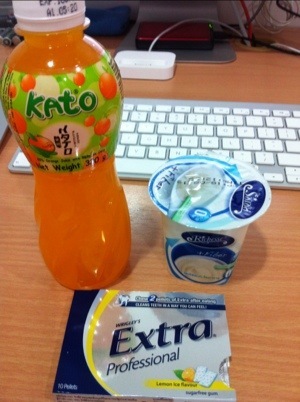 Coincidence- a quick trip for a snack cost thb40- juice (thb12), yogurt (thb13) and gum (thb15). The bowl of noodles certainly is the best value as the quantity and flavor are worth much more than thb40. And that is the lesson I learned, the more local, the better the experience and value. You want a brand like Starbucks, you figure out why it costs 2x more than a *meal*. I’ll keep eating local, spending my thb40 and posting additional pics of what thb40 can buy. 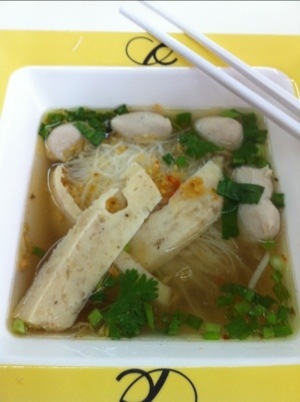 This entry was posted in Food & Restaurants, Thailand and tagged noodles, Starbucks, Thailand, thb. Bookmark the permalink.